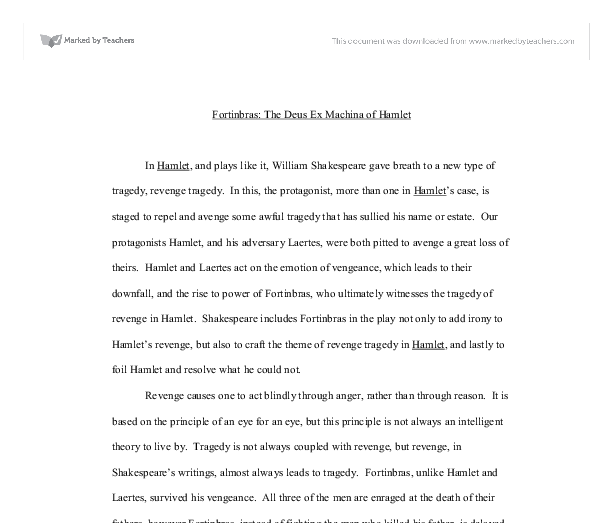 Fortinbras: The Deus Ex Machina of Hamlet In Hamlet, and plays like it, William Shakespeare gave breath to a new type of tragedy, revenge tragedy. In this, the protagonist, more than one in Hamlet's case, is staged to repel and avenge some awful tragedy that has sullied his name or estate. Our protagonists Hamlet, and his adversary Laertes, were both pitted to avenge a great loss of theirs. Hamlet and Laertes act on the emotion of vengeance, which leads to their downfall, and the rise to power of Fortinbras, who ultimately witnesses the tragedy of revenge in Hamlet. Shakespeare includes Fortinbras in the play not only to add irony to Hamlet's revenge, but also to craft the theme of revenge tragedy in Hamlet, and lastly to foil Hamlet and resolve what he could not. Revenge causes one to act blindly through anger, rather than through reason. It is based on the principle of an eye for an eye, but this principle is not always an intelligent theory to live by. Tragedy is not always coupled with revenge, but revenge, in Shakespeare's writings, almost always leads to tragedy. Fortinbras, unlike Hamlet and Laertes, survived his vengeance. All three of the men are enraged at the death of their fathers, however Fortinbras, instead of fighting the men who killed his father, is delayed in a march of power through the Danish lands to attack the Polish, and not the Danes instead. ...read more. Hamlet realizes, through the eyes of jealousy and zeal that he has no time to waste in planning his revenge and taking action. His words seem to hint towards a tragic ending. "O, from this time forth, My thoughts be bloody, or be nothing more." (65-66). In his last soliloquy, Hamlet's personality is revealed through comparison to Fortinbras. The reader sees how at a mere suggestion of failure he commits to do nothing but seek revenge. This line reveals that Hamlet will vie to avenge his father at all costs to himself and others. His last quote, referring to nothing but bloody thoughts, seems to be a reassurance that Hamlet will take revenge; to more effect, it also foreshadows what lays ahead for Hamlet himself, and nearly everyone else. So it can be seen that Fortinbras is the perfect foil to Hamlet. They are two men, completely opposite of each other in nature, befuddled in the exact same situation. Hamlet does not necessarily hold Fortinbras in contempt or hate, but more in envy. Although his mind and madness seem to scar him more than anything, Hamlet's tragic flaw, his hamartia, is his inability to act; his unwillingness to get things done lies in sharp contrast to that of Fortinbras. ...read more. He is a character with little prior action in the play who comes to the Danish land to claim his throne and apparently fix everything. For me, with sorrow I embrace my fortune. I have some rights of memory in this kingdom, Which now to claim my vantage doth invite me. Let four captains Bear Hamlet like a soldier to the stage; For he was likely, had he been put on, To have proved most royally; and for his passage The soldiers' music and the rites of war Speak loudly for him. Take up the bodies. Such a sight as this Becomes the field, but here shows much amiss. Go, bid the soldiers shoot." (Fortinbras 5.2. 419-435) So now, why exactly did Shakespeare have Fortinbras appear on stage? Fortinbras, first and foremost, was a foil to Hamlet. He represented what Hamlet had not achieved. Secondly, to add to the tragic revenge of Hamlet, Fortinbras brought tragic irony and vain to Hamlet's efforts to serve his father and become king. Lastly, while Shakespeare probably did not intend it, Fortinbras came on the scene of the play with little mention, to seize the crown of Denmark and give Hamlet a proper showing. He also attained what Hamlet could not; vastly not superior to Hamlet in many ways, Fortinbras avenged his father's death and became the king that Hamlet could not be. Life, therefore, is not without a sense of irony. ?? ?? ?? ?? 2 ...read more. Instead, Laertes gathers a mob and storms Claudius' throne. Hamlet sets up a whole play in order to confirm his suspicions about Claudius while Laertes confronts Claudius immediately without any evidence to bolster his claims. The decisions made by Laertes helped me realize no matter how calculated Hamlet or how rash Laertes were throughout the play, both made decisions that lead to their eventual demise. Hamlet then suddenly drops his antic disposition right after his dispute with Laertes in the graveyard as he began speaking and acting completely normal at all times which was illustrated while he mocked the courtier, Osric. "My father's brother, but no more like my father Than I to Hercules" By this statement it is meant that Hercules was fathered by Zeus; however he was raised by humans. From this the audience can see that Hamlet is a very strong-willed character, he was very religious and he dearly loved his father. Cowardliness and weakness were not tolerated in Roman society. Claudius would not have gained much support from his people if they thought him to be nothing more than a fool. His own mother used to call him "a monster: a man whom Nature had not finished but had merely begun". 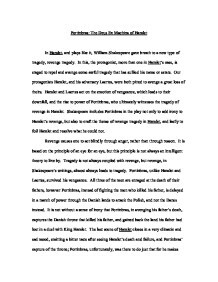 Discuss with reference to language how the soliloquies reveal the character of Hamlet. His admiration for Horatio and cold attitude towards Rosencrantz and Guildenstern tells us that he is a philosophical prince, and he is sociable and that he respects people who do not reach the levels of his own social status. He confides in Horatio throughout the play. Examine critically the character of Hamlet as revealed through his soliloquies. He reacts quickly when he realizes that his mother had been poisoned, and he ends Claudius life. If Hamlet had been a man of action, the tragedy would never have occurred but he had a philosophical bent of mind. He always analyzed the rightness and the consequences of the action.